This event would be interesting to discuss at an Emergency Preparedness merit badge meeting, or as the topic of a Scoutmaster Minute about Being Prepared. 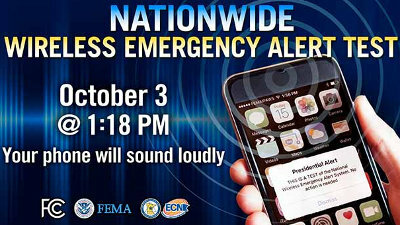 At 1:18pmCDT on Wednesday, Oct. 3, your cell phone will alarm with an emergency broadcast message from the President. Don't worry, it's just a Nationwide Wireless Emergency Alert Test, not a real emergency! Have you ever received an Amber Alert msg? It's similar to that, except for everyone in the country rather than a specific area.